BCC100 - ACE Peripherals ::: Completing I.T. View 2 months of construction in just 2 minutes! Months of construction captured in minutes of time lapse video! The Brinno Construction Camera is the effortless way to record any construction project. Set it and forget it. Create a time lapse video recorded at the rate you choose and played back at the speed you select when the project is complete. - Time Interval: 1 min. The Brinno Time Lapse Video Construction Camera is the effortless way to record any construction project. Set it and forget it. Get a time lapse video recorded at the rate you want, and played back at the rate you want when the project is done. Do you still use a DSLR to capture construction photos? Then spend a lot of time combining those photos into a time lapse video? Drop the traditional way, now you have better choice! Brinno Construction Camera produces Ready-to-View time lapse video in the camera with one button! You never knew how easy it could be! 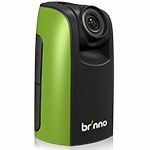 Brinno Construction Camera operates on long-lasting batteries. 4 AA batteries can last up to 4 months. You never need to worry about finding a power outlet! Wire-free, tool-free, worry-free! No complicated power cord wiring to set up, no complicated video post-processing, easy to set-up, easy to use! 3 steps to create construction time lapse video. Why using Brinno camera for construction project? The 1.44” LCD screen allows you to frame your subject simply. Better low light recording and sharper images. 140° field of view. A wider area is captured creating panoramic images of your project. IPX4 weather resistant housing, let you records any project, indoors or outdoors. Worker friendly, Easy to set up! No Professional photographer is needed to setup and operate or relocate the construction camera. Any worker will be able to get the job done. The 140 degree field of view allows you to capture more of the panoramic construction site equally and simply. The f1.2 extra low light lens allows you to capture in low light, and see the details often lost in the dark. You will never miss any on site activities. Yes, we know most construction site are outdoors; and in order to let you capture your entire construction project in any weather, we provide a weather resistant housing to protect your construction camera. We recognize the value in building successful relationships with an extended network of Time-Lapse Photography/Video technology for utilizing Brinno products; we are continually expanding our partner portfolio. The following companies have taken the next step with Time-Lapse Cameras by completing a Time-Lapse photography/video with additional Brinno Security Products training and certification course. These companies are Brinno authorized service providers and sharing our commitment to best in class customer service and support. Brinno ships the exact product shown in the picture, however, colors and photos shown may vary from actual product colors due to computer monitor display settings. Therefore the you see here may be different then the actual product shipped. * SD card may or may not be included, please read the package contents listing.